I grabbed this 10" fan at Wally World today to check it out. It is an Ozark Trail portable camping fan. Supposed to run on 8 D batteries (12 volts). I connected a 12 volt plug to it for a test. It works absolutely great. Has 2 speeds and is not loud at all yet moves plenty of air on either speed. It folds for storage or hanging in front of a window or sets on it's base. It could also be mouted sideways on a wall and folded out of the way when not in use. I checked the current draw with a digital meter and it draws .46A on low and .65A on high. I was impressed. I was going to use computer fans but this is way better. How do you connect a 12V plug to it? Does it come with that option or is it something you had to modify? This could be great for pets. You wouldn't need to hard wire it and they would be safe. This fan is supposed to run for 24 hours on 8 D cell alkaline batteries. I think I will load it up with batteries but stick a cardboard tab on one end of the battery and run off 12 volts. Then if my deep cycle dies on a really hot night I can remove the cardboard tab and run on D cell back up. This thing is made for teardrops! How do you run it off of 12 volts? Buy a cord and plug it in. It has a 12 volt input. This post is edited since Walter pointed that out. I think MadJack is right, if this thing turns out to work OK horizontally I will try to modify one to go in my roof vent. Product note: To extend the life of the product, please turn off the fan when not in use. Last edited by EZ on Sat Apr 22, 2006 12:14 pm, edited 2 times in total. I saw a similar item at Target. From Coleman, I think. Will probably get one for my trailer. How about putting rechargable batteries into it and then installing a Harbor Freight 12 volt solar charger on the roof to keep it charged? 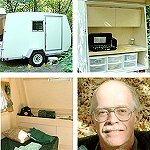 The tiny trailer in the avatar is designed to carry our recumbents and sometimes sleep in. We LOVE having a kitchen in the woods and a place for most of our gear. EZ wrote: This fan is supposed to run for 24 hours on 8 D cell alkaline batteries. I think I will load it up with batteries but stick a cardboard tab on one end of the battery and run off 12 volts. Then if my deep cycle dies on a really hot night I can remove the cardboard tab and run on D cell back up. This thing is made for teardrops! I plan on going to Radio Shack and getting a plug and socket and mounting the socket in the side of the battery compartment so that I can disconnect the cord for storage. EZ........looking at that second photo, isnt that a jack installed at the bottom of the fan case? So you could just plug it in? I saw this fan too and for some reason I thought there was a jack on it. You are right. It is a very good buy! That's a great little fan. We've been using ours for about a year now. When you plug it in to 12 volts it disconects from the batteries. Ours had an adapter plugin hole on the side of the fan, didn't need to do any modifications to plug in the 12 volts. We just got an adapter plug from Radio Shack and wired it to Cigarette lighter plug. A 12 volt input. Oh man, I didn't even see that!!! Nice Walter. I was so busy connecting it to my battery to see it work that I completely missed it. That is so sweet. There, now I retract my post about making it a 12 volt fan. New procedure: Buy a cord and plug it in. I picked one up to keep the dog cool in thr truck and will probably get another for tear use. Very quiet and mooves a fair amount of air. With my 18V/dc power supply in tear it should crank out a few more rpm. Just got back from Wallyworld. They have 2 versions of the fan. The first I saw was in the fan/AC section, with the O2 Cool logo. It comes with a 120VAC-12VDC wall wart. The second was in the camping gear, with the Ozark Trail logo, and the O2 Cool logo smaller on the package. I believe both were battery powered, as well as having the 12DC socket. Ozark Trail version has a drop down foot, which is where its batteries are stored. One was $12.89, and the other $13.89. I picked up the Ozark Trail version. I was also looking at the Trunk Box that has been mentioned previosly. I saw a larger box that would work on my trailer tounge. 36" wide, deeper and taller than the trunk box, but going for $44. I think I've found whats going on the front of my trailer.